Makeover Winner at the Spa Today! Skincare Specialist Kelli June and I team up with Nick from Pink Diamond Artistry to do a makeover today! We’ll honor our Women’s History Month Makeover Winner Judy Boen from Captive Hearts with a visit to the spa for a facial, hair and makeup. She’s our business neighbor here in Grover Beach! We can’t wait to meet her, see her outfit from Collections Rack, and work our magic with her. It really is hard to beat the relaxing, cathartic effects of lounging in a warm tub of water, where the mind can so easily find peace and calm. These simple moments of indulgence are a great way to end the day, as well. The winter months can be harsh on our skin, regardless of our moisturizing regimens. But when done correctly, a nice bath can actually hydrate and re-mineralize your skin. Ideally, your tub water is not too warm, as that can dehydrate your skin. Around 100 degrees Fahrenheit is where you want it. Turn off the phone, turn on some soft music, and close the door to the day’s problems. Undaria Algae Oil – We use this for the body massage during Facials at Star Brows! This lightweight marine-based body oil is rich in organic botanical oils, sea minerals, and antioxidants. This is the ultimate skin repair, loaded with luscious seed oils–acai, babassu, passion fruit, sesame–and Undaria Algae, to deliver powerful antioxidant vitamins and essential fatty acids to dry, sun-damaged skin. Check this out for use with tattoos. Green Marine Detox Bath – This is a potent bath powder that helps heal eczema and psoriasis and is rich in minerals, enzymes, and vitamins that the skin is able to absorb, including phosphorous, zinc, potassium, and calcium. USDA Certified Organic Undaria Seaweed from the pure waters of Patagonia. This purifying, powerful, antioxidant-rich seaweed helps with hormonal imbalance and water retention. Salts of the Earth Scrub – Spiked with certified organic botanical oils from around the globe. Salts of the Earth come from the Dead Sea, the Bolivian coast, the Utah desert and the Himalayas. This exotic blend of the purest salt on Earth contains 84 trace minerals and gets its unique pink color from the rich ores they contain. The ingredients in these salts plump up the skin, enticing it to soak up nutrients and look more youthful. Undaria Body Polish – Natural exfoliants feel gentle on the skin while delivering a stimulating scrub action. Small and powerful pumice grains help remove dead cells along with a bio-scrub blend of acai and guaraná. Guaraná is recognized for it’s tonifying and astringent properties, as well as reducing cellulite. Acai delivers a powerful synergy of healthy-aging properties to skin, plus hemp and passionfruit seed oils feed the skin Omega 3-6-9 essential fatty acids. When a product is the Monthly Feature, like the OSEA Bath Products this month, you’ll get 20% back in Rewards. I’m excited to announce a special perk for being a loyal Star Brows customer. You, after all, are the Star at Star Brows! You’ll earn FREE services with any skincare or cosmetic product purchase, it’s called Star Brows Rewards. Make a purchase of skincare products or cosmetics at the spa. 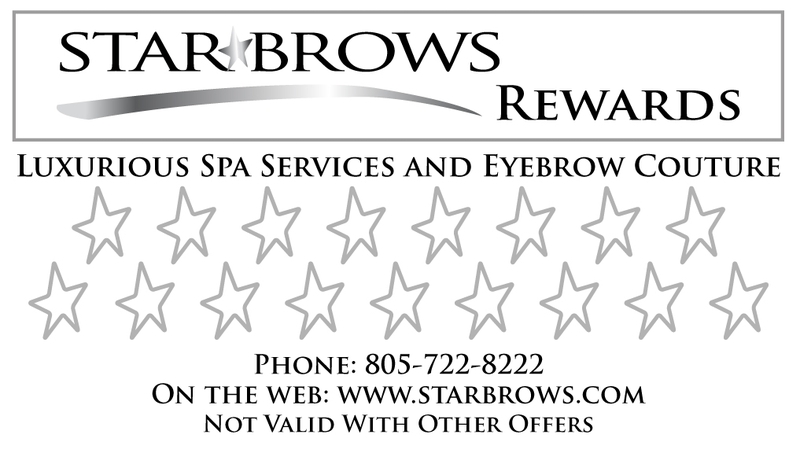 We’ll start a Star Brows Rewards punch card, and keep track of it for you. Redeem your Rewards for a spa service Enhancement when you come in for a regularly priced service. Service Enhancements are listed below. It gets even better: The Monthly Product Feature offers double Rewards! That’s 20% of every purchase back in Rewards. Waxing Enhancements – Star Massage, Face Part Wax (chin, lip, cheeks, nostrils, etc.). Facial Enhancements – Power Pumpkin, Salicylic Acid, Retinol or Primary Alpha Peptide Resurfacer. A: Rewards can be redeemed for Enhancements only, when receiving a regularly priced spa service. A: Yes. Although some of the Enhancements are easy to do in conjunction with any service, some aren’t. Chemical Peels, for example, need to be done with a Facial, Raindrop Therapy with a Massage, and Lash Tint with a Facial Waxing service. Our customers love this program, and we love offering you great deals and thanking you for shopping with us.